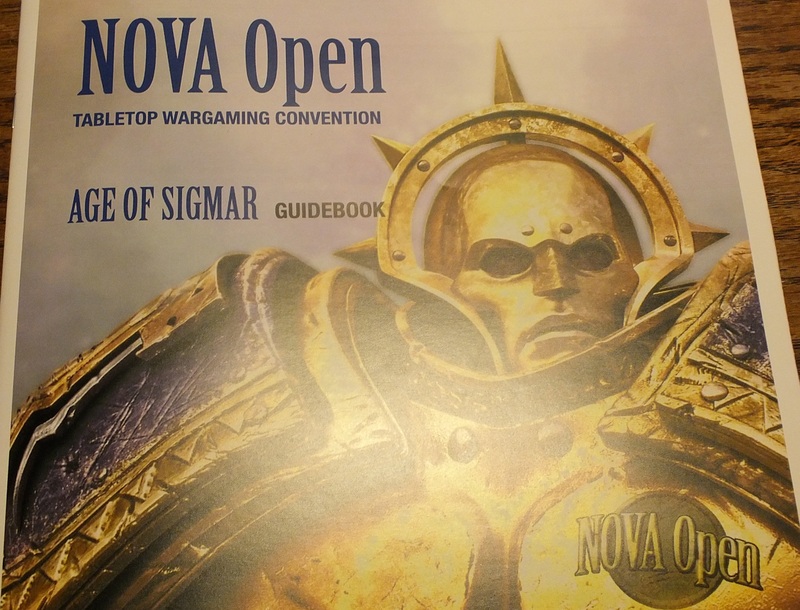 Warhammer Age of Sigmar events returned to NOVA Open tabletop wargaming convention for the 3rd year, and the narrative event expanded to cover six linked but separate events across four days from Thursday afternoon through Sunday. Developing the results of the narrative from 2016, we brought back the ziggurat where Queen Neferata ruled over a corner of the Realm of Shadows called Dawnland. From her throne atop the ziggurat she allowed the forces of Death to infiltrate and permeate the realm while a secret organization of spies & assassins known as “The Hands” planned a rebellion with prominent members of the noble Houses of Dawnland as well as some leaders of the Union of craftsmen. These Guilds were united in a common goal to remove Neferata from the throne and install a regent with interests more aligned with the realm. 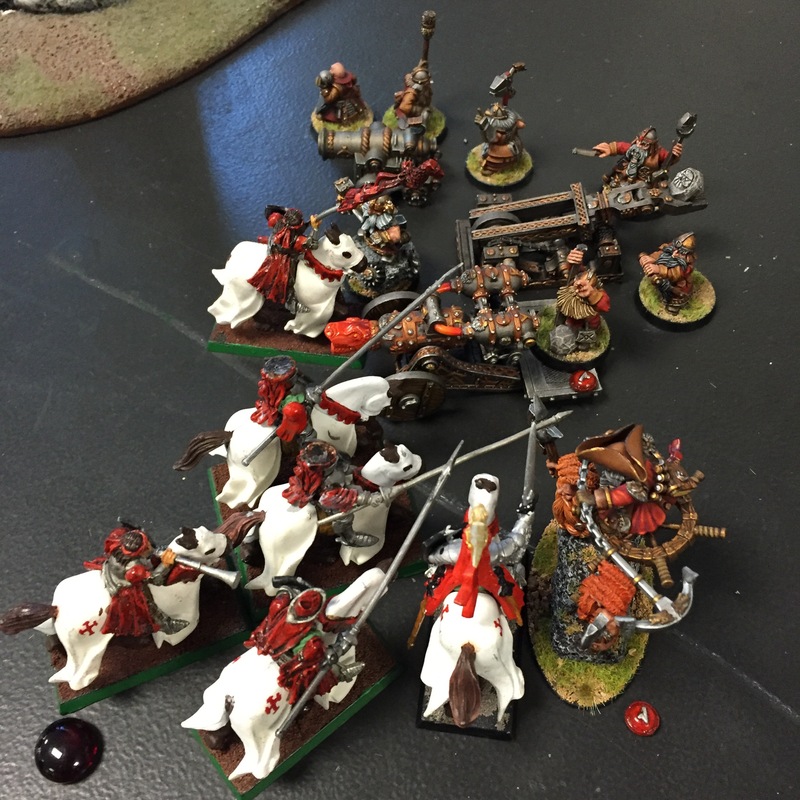 The games started Thursday with the return of the ships built specifically for the Age of Sigmar narrative event last year. Each player took command of a ship and deployed a small warband on board and took to the shadow seas. The first battleplan described an assortment of sea captains sailing toward the coast of Dawnland, attracted to a kingdom in political tormoil, and captains had the opportunity to raid or trade with other ships. In later battleplans the players moved their respective ships through dangerous shoals and eventually toward the rocky coast. 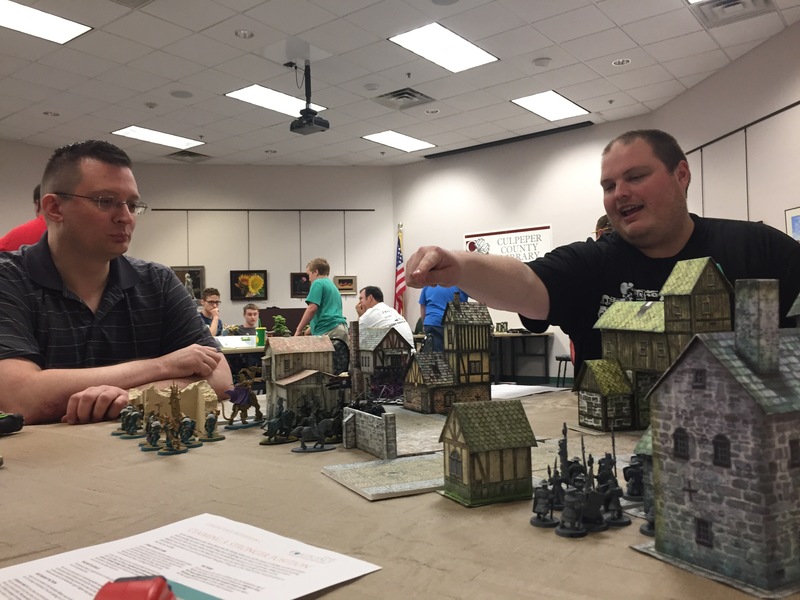 Thursday evening featured a full game of Triumph & Treachery including the cards adapted from the original T&T cards from Warhammer Fantasy Battles as players used coins to bribe opponents and purchase special indulgences from the ShadowGuild bank. Each player attempted to collect more obsidian shards from a long forgotten island in an attempt to collect mystical energy to strength respective guilds. Friday was a full day of a Path to Glory campaign while the doubles event kicked off on the other side of the hall. 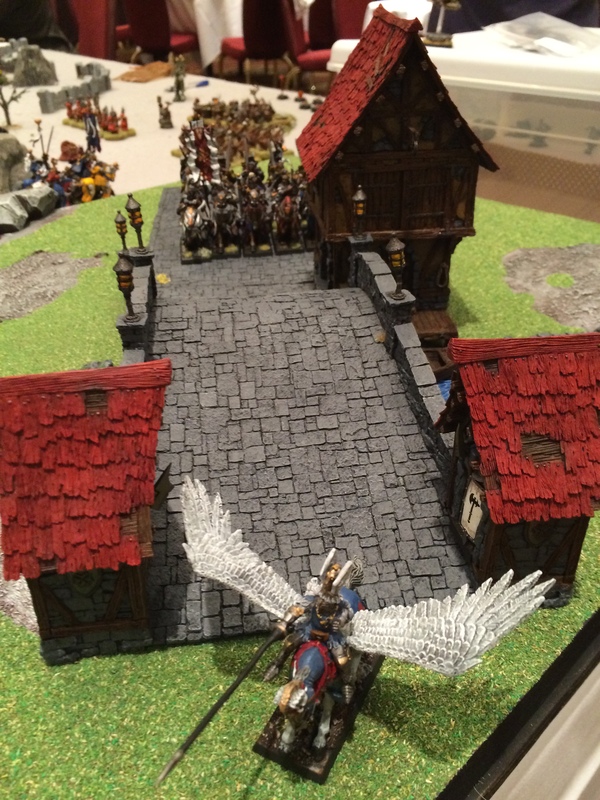 Each player started with a small warband and added units and rewards to the warband after each round of games. Again, we used the Mod Cubes to designate mysterious scenery. 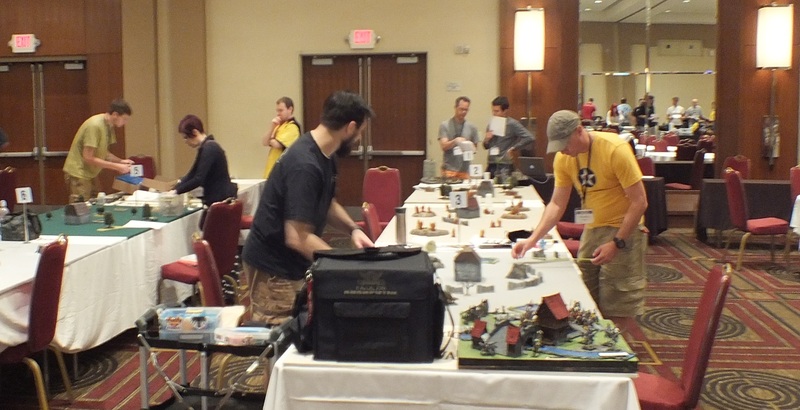 Twelve players were matched with starting warbands, and by round 3 the event shifted to paired team games while the doubles event raged in the background of the hall. 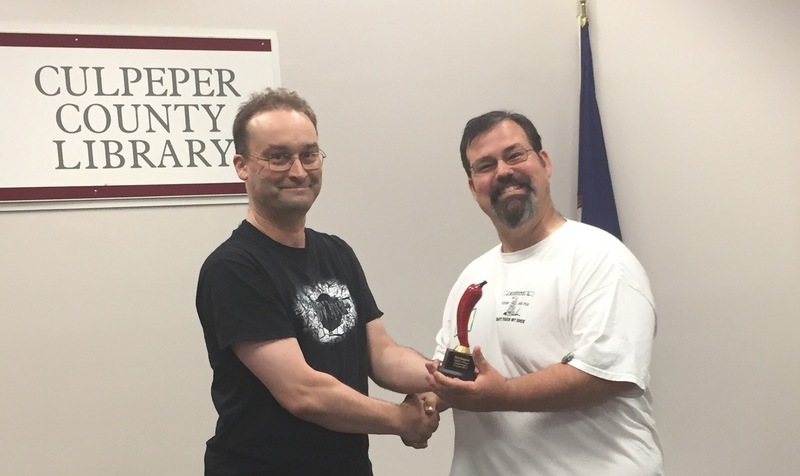 Sean (left in white shirt) won the Campaign Hero award for earning a number of Green Dragon Eyes from opponents and a NEO’s Choice certificate; Kevin (right) won Most Treacherous. After a dinner break another Triumph & Treachery game commenced with 3-4 players at 3 tables using the T&T cards and coins for bribes and buying indulgences. Saturday saw some minor skirmishing while the GT started in the main part of the hall. But Saturday night the guilds returned to fight over the dockyards along the edge of a burning city. Three separate games of T&T were played simultaneously with special rules for crossing units from one table to the next. Renee’ (red shirt) reprised her role leading Queen Neferata’s loyal forces, but by the end of this round of games her control of the kingdom had eroded by the conspiracy of the Houses and the Hands guilds. Loyalties shifted and changed throughout the evening, but at the end the Queen was on the edge of defeat and the Guild of Houses had the largest paychest to fund the final push in the war. 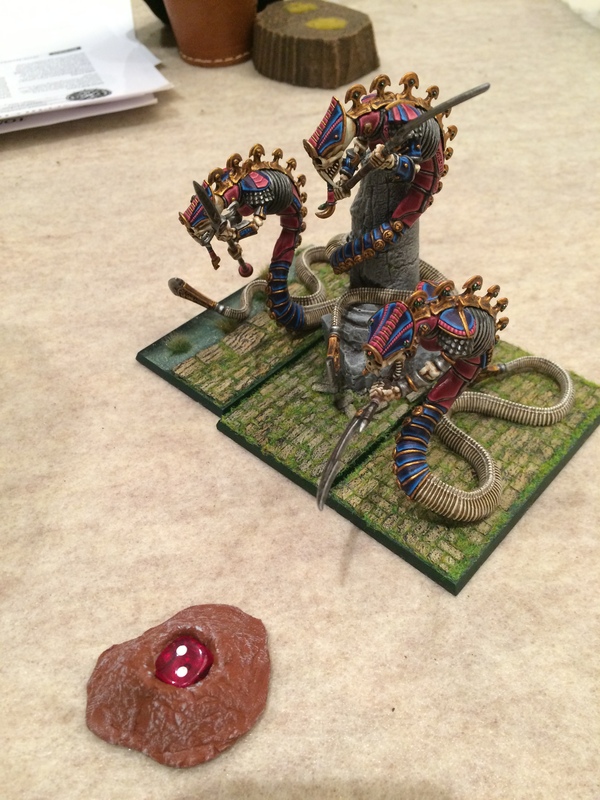 Sunday, as the GT finished the 4th & 5th rounds, a final T&T game was played at the foot of the ziggurat. There were few survivors. The Queen was forced to flee into exile, and the Hands finally secured the throne but found the treasury empty. The newly knighted Lord Svok, in a desperate attempt by the Queen to secure loyal allies, had absconded with most of the kingdom’s gold and set off at the head of the largest mercenary army of Ogors the realm had yet seen. Mathew won “best army” for the grand narrative in addition to a NEO’s choice certificate for his assistance helping new players learn the game and leading his guild to controlling the largest paychest of coins. The Warpeper club hosted a Coalescence event in the local public library. We had a number of experienced players along with a few new players, but everyone had a great attitude and enjoyed the games throughout the day. 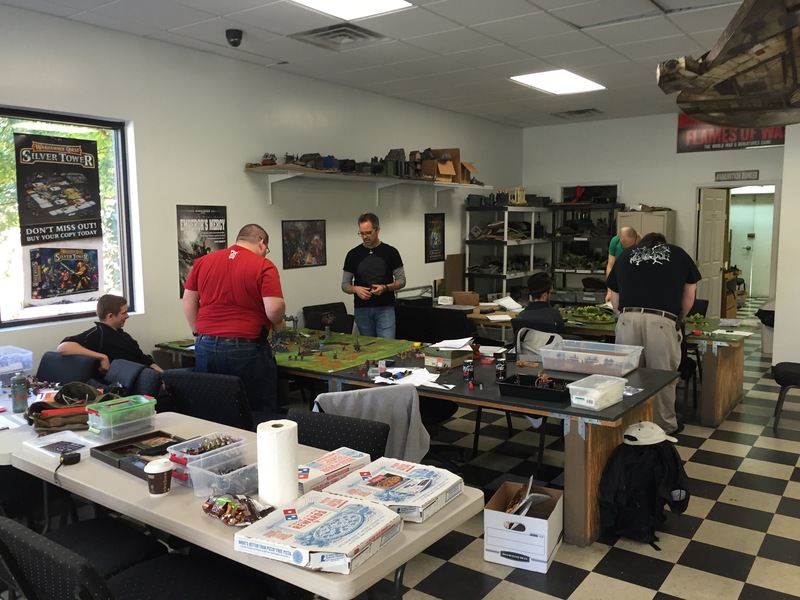 A few months previously we hosted a Warhammer demo games day which featured both 40K and Age of Sigmar games. We provided armies for interested gamers to try out either game system, and we had a successful painting station where teens had a chance to paint a model for the first time. 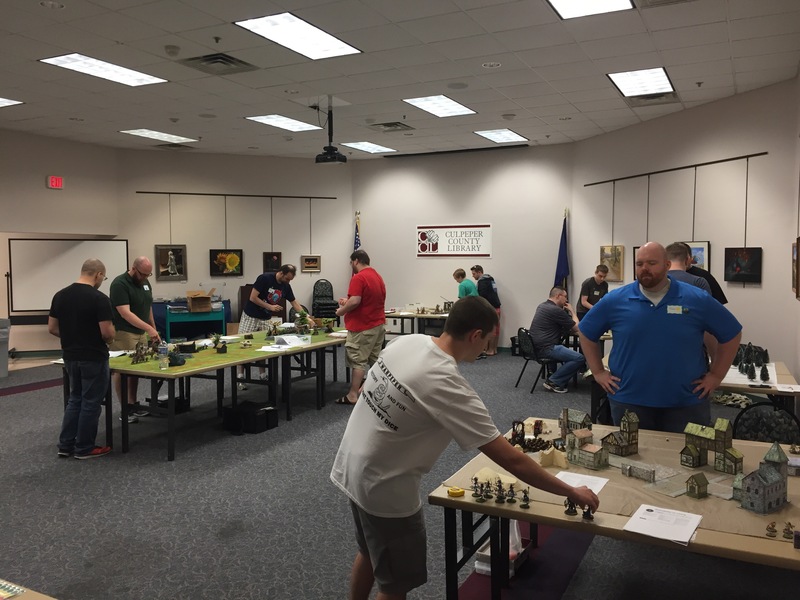 Several of those teens joined us for our Coalescence event, playing loaner armies provided by members of our local club. 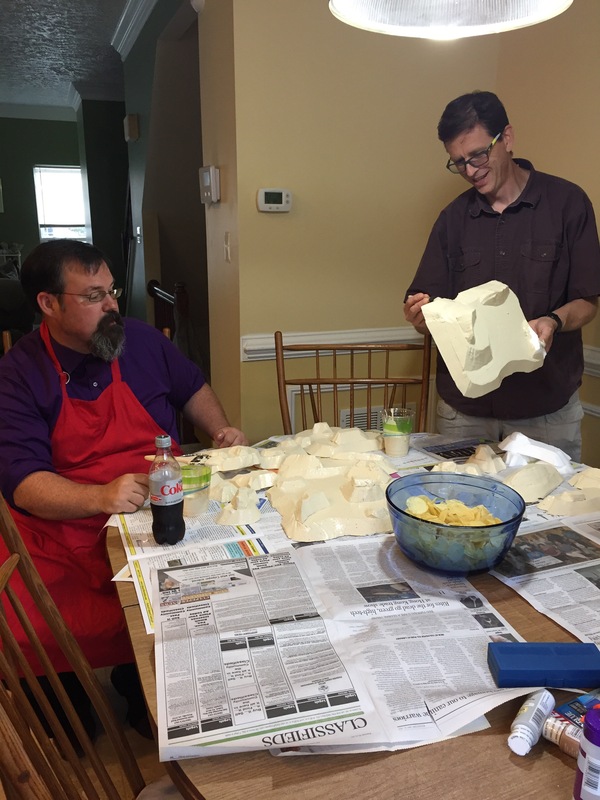 One of our club members also offered to coach the new players–he was also one of the helpful guys building more terrain when we actually hit our maximum limit of 16 players signed up. 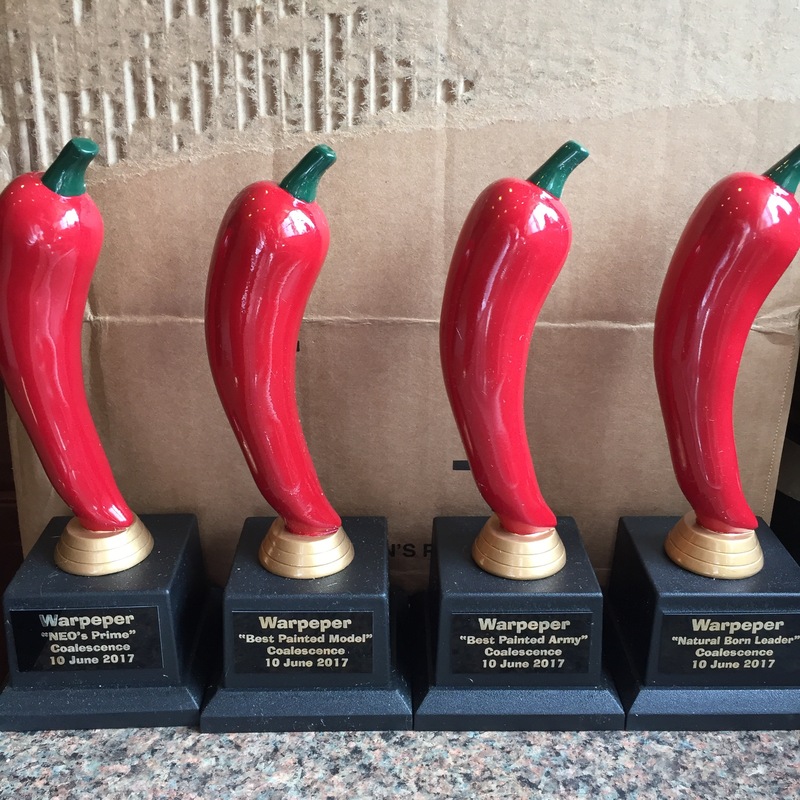 And I ordered some modest trophies for the event, keeping with our “pepper” theme. Because this was both a narrative and team event, awards were intended to recognize winners of the painting contest (winners determined by popular vote of all attendees) and most valuable player of the winning team as well as the NEO’s prime prize. Day of the event, June 10, even with a couple of late cancellations, we had a total of 15 players, and Chaos was well represented with 6 players; 2 of those Chaos players graciously volunteered to join an alliance with Death. Four almost equal teams were matched and commenced the first round of games. In the weeks leading up to the event, players were encouraged to post a story about their generals on a thread in the narrative section of The Grand Alliance forum; every one that had posted by the deadline received a bonus card with a special ability or item customized for the respective general during the games. 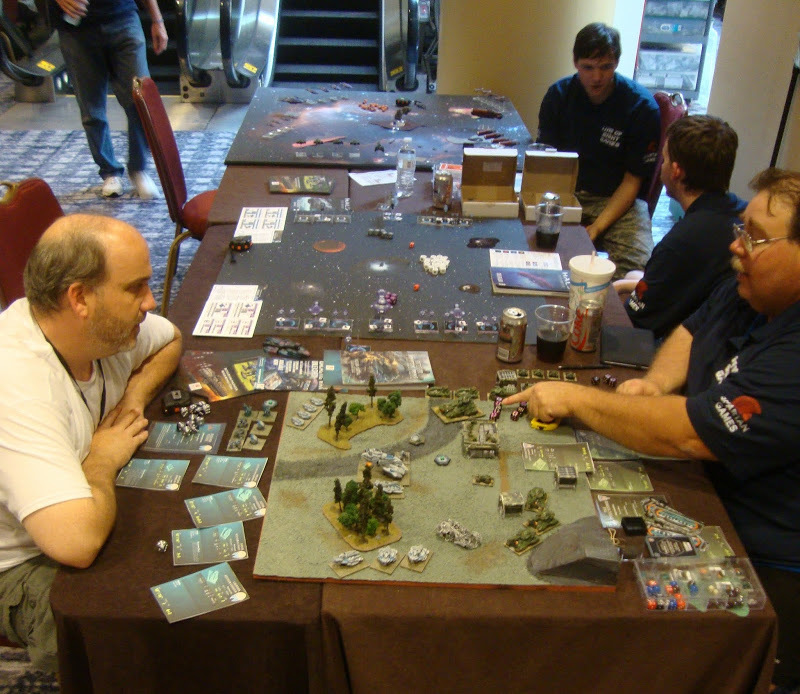 Club member Chris playing for the Chaos team while wearing our white Warpeper shirt at the first table. 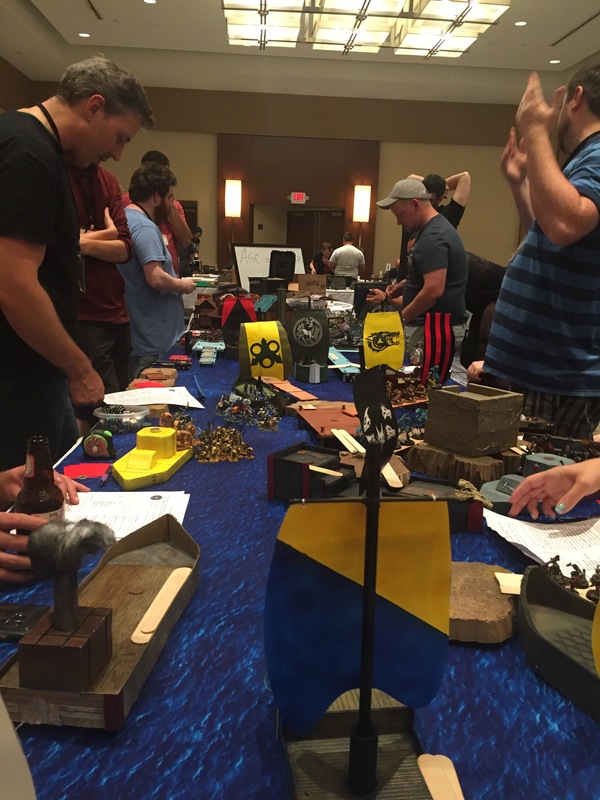 The Chaos team took the lead in the first two rounds of battles, narrowly followed by the Order Grand Alliance, but in the multiplayer 3rd round of games, the Destruction team challenged the Chaos armies, and the Order team took the lead to win the Pepper crystal. During the lunch hour all attendees had cast secret ballots for their favorite armies and single models, and we handed awards to those painters while also announcing the winning team. And in recognition of his help building terrain and coaching the newer players through their games, the NEO’s Prime award went to club member Isaac. 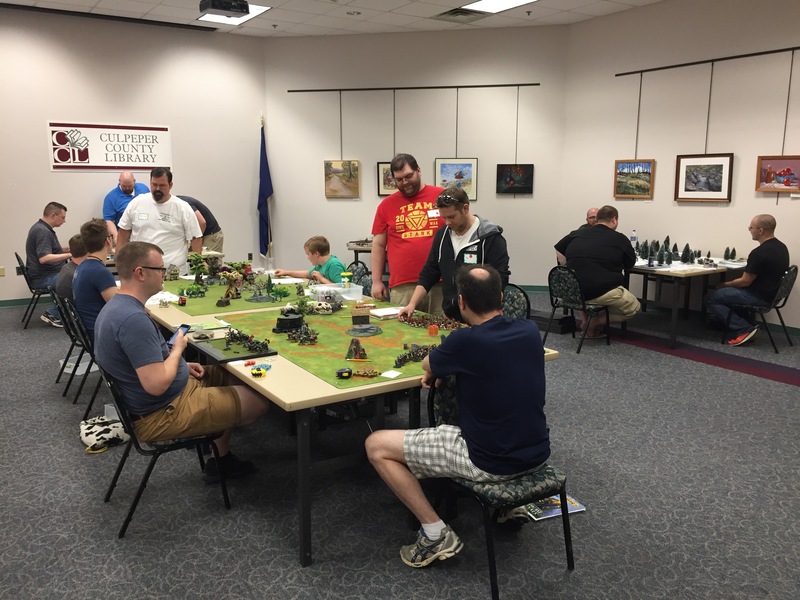 I appreciate our local public library allowing us to use their meeting space and tables, and to those in my local club that helped me build terrain, loan models for new players, and help with the logistics of setting up an event for this many players. Fifth of November. The Wizard Fawkes has absconded with the King’s mystic orb, and six generals lead their armies to find Fawkes and retrieve the artefact. Thanks again to the Game Vault in Fredericksburg for hosting. The players were divided into groups of 3 at each table and set up 1,000 point forces each for the first round of Triumph & Treachery. The Wizard Fawkes had been spotted and the lead element of each army converged on the Wizard has he appeared to be furiously working his artefact in a desperate attempt to teleport away and escape. Skaven, Chaos Bloodbound, and Duardin all move in to grab the artefact. The Duardin got to the wizard first–Fawkes vanishing in a cloud of mist but leaving the artefact to fall into the hands of the Duardin lieutenant. 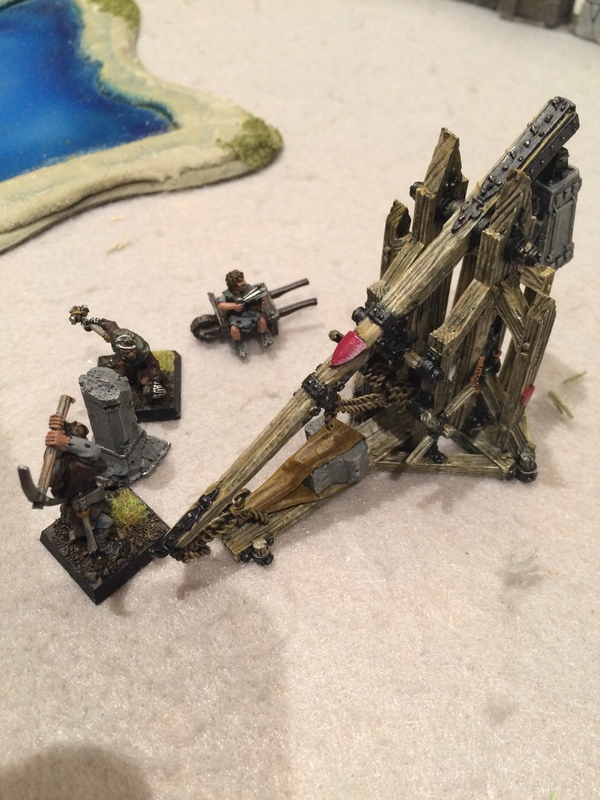 Skaven jezzails attempt to snipe the Duardin artillerists. The model carrying the artefact climbs aboard the flying boat and escapes the clutches of Chaos. Meanwhile, at the other table, forces of Order, Chaos, and Destruction moved into a ruined temple complex to capture what appeared to be the Wizard Fawkes. It turned out this was the real Wizard, and the Duardin flying away discovered they had only captured a forgery which crumbled into dust. In the second round of games, players took only a small scouting force composed of no more than 100 points of models, without any heroes, and sent these lead elements ahead to find the missing component which Fawkes had dropped before capture and which would unlock the full power of the artefact. 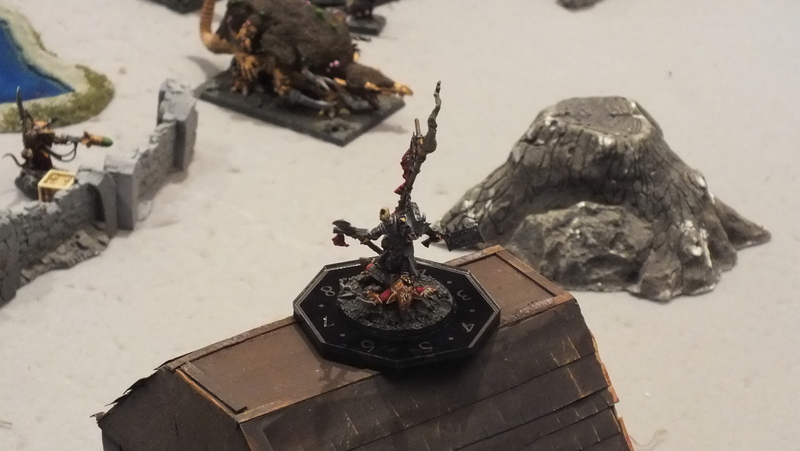 Once again, the Orruk warboss found fortune when his scouting troops found the key nearby in the temple complex. Now the full power of the artefact belonged to him! Would he immediately return it to the King or use it for his own nefarious schemes? Eric brought along his customized deck of terrain cards to help players keep track of what different special terrain features did during the game. Very handy! This is the Skaven abomination that simply would not die! It consumed a unit of Maneaters before turning to eat a pair of heroes. 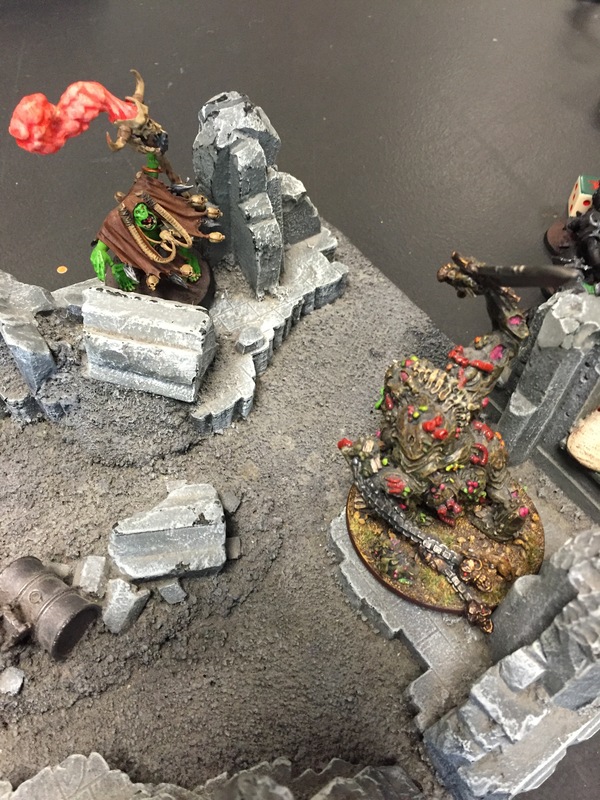 An old Skaven cannon catches a shaman standing in a clearing on a nearby hill and shortened the lifespan of the fellow. In the third round of games the full might of each general’s army was in the field, all 2K points for each player. All was thrown into disorder as each general fought to position themselves for superiority before the mystic orb could be used to change the course of history in the realm. Even the forces of Order turned against each other. Nurgle sent his own chosen to stop the Orruks and their Warboss with the artefact in his hand. Unfortunately he had unlocked the full power of the artefact and was not only able to teleport to any point on the battlefield but also was able to manipulate time (allowing a re-roll once per turn). The Orruks stayed on top and won the event! 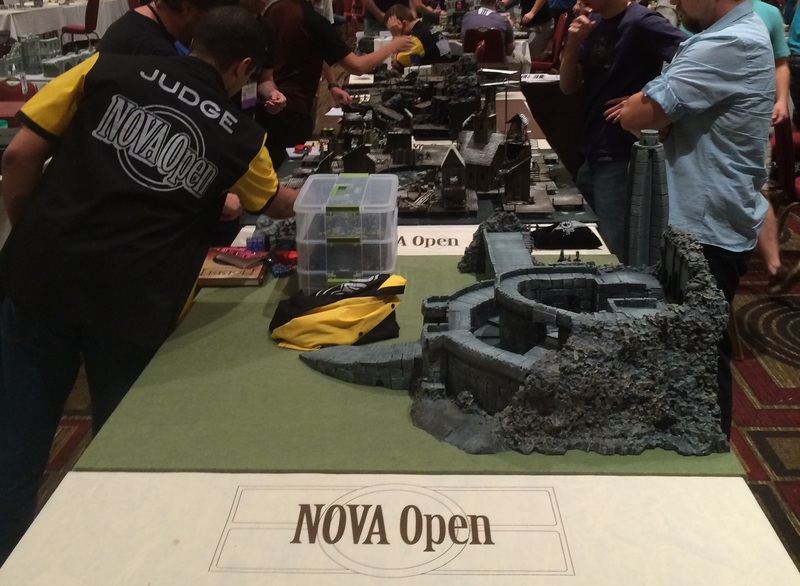 We played a 9-round narrative event covering 4 days at NOVA Open. 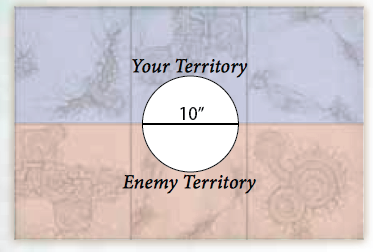 Players took on one of two roles: a barbarian Warlord for Chaos, moving to destroy or capture all the inhabitants of the kingdom of Dawnland, an obscure corner among the thirteen regions in Ulgu the Mortal Realm of Shadows, or a Low King’s Warlord, moving to check the forces of Chaos and secure the High Throne for your own Low King or one you have found as an ally. For the purposes of this event, any Warhammer Age of Sigmar faction could fight for the Chaos invaders or the defenders of Dawnland. We started with a world building session, drawing a map of Dawnland. This was not a map-based campaign, but the map helped us imagine the setting and determine some locations where the various battles happened. During this session it was also determined that the Shadow Ziggurat never stayed in the same location for more than a day, and that created a twist that changed the course of the campaign. After a round of warm-up games, with randomly matched players, we played the multi-player introductory game using the Triumph & Treachery rules from the General’s Handbook. As one player suggested, it would have worked better as a team scenario, but everyone still enjoyed the game, and we got our first example of inevitable betrayal. The High King of Dawnland arrived at Citadel, the largest city in Dawnland, and spent the night in an inn, preparing for his role in the upcoming trial of champions when the best hero would stand on top of the Shadow Ziggurat during the Great Eclipse and determine the next High King. But shadow agents assassinated the High King and tried to escape the city… with a little help from some new friends. The two tribes of duardin turned on each other in a deadly street brawl after one tribe switched allegiance to aid the assassins. After the Fyreslayers turned on the court guard of Low King Gaius–his force had been in a prime position to intercept and capture the assassins which then escaped due to the betrayal–they crashed into the a brutal street fight with the Citadel Duardin High Guard, defenders of the capital city. This was a significant win for the Chaos invaders as the defenders of the realm had failed to come together in a united front. 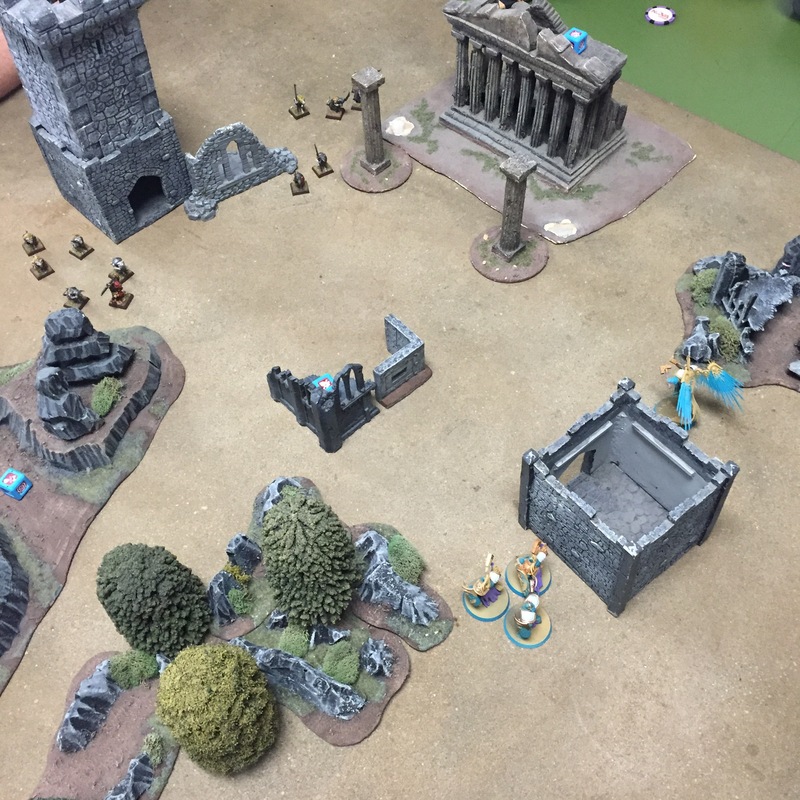 The following morning, Friday, we had 8 players playing on four different tables–each tables has special scenery with special arcane artifacts which could be retrieved and used in battle. There were also special narrative cards which were won by teams or individuals depending on achieving specific victory conditions. And any player that was tabled in a game and had an entire army removed received a bonus card as well to be used later in the event. In the Quickfall Marshes, a raiding Orruk warband attacks King Gaius Insatiable and his Court which was searching the stagnant pools for lost artifacts. The Orruks charged and the Orruks died. In the Loewnthrall Forest Lord Vynwyrd rallied the Sylvaneth to defend the arcane trees, but these ashen-skinned Orruks were different, and the Spirit Krushas tribe cleared the forest of both spirits and trees. Many ancient and arcane trees were felled during and after this brutal battle. In the lonely Dawnland village of Haybale Hollow, the 7th Legion organized and put up a stalwart defense and destroyed the Chaos spearhead, but at the cost of Lord Invictus suffering a terrible wound. In the Jadenvyne Jungle Queen Neferata led her skeleton crew to find sacred artifacts, competing and besting two of her rival Chaos armies to prove herself the sole leader of the full invasion. The Shadow Ziggurat loomed over the battlefields. We had determined, during the worldbuilding session at the start of the event, that the Ziggurat slipped among various locations, the next location unknown to any but the High Priests of Shadows. The initial attacks had stalled, but the Chaos invaders renews their aggression and smashed their way through many small Dawnland villages. Friday afternoon featured 10 players battling across 5 tables. The Dawnland village “Burn it Down” battleplan had the Chaos invaders trying to burn down as many buildings as possible, while several other defending players played “The High Road” which required movement across the length of a table to get information and supplies to their allies. A warband of Duardin defenders attempt to stop a Korne Bloodbound force from burning destroying another village.. The Duardin gunners were ordered to provide nominal resistance, but the village would burn and the story of the Chaos barbarian’s rampaging would be used to fuel and solidify political support behind Low King Gaius and his Insatiable Court. The Bloodbound burned many buildgings, and many of the Low Kings pledged their support to Gaius following this atrocity.From across Blackshadow Bay a Chaos fleet approached and attempted to block resupply convoys for the kingdom’s defenders. The spearhead of the invasion, a legion of bloodbound calling itself the Fleshstompers of Fine Bloodwine and led by the fearsome Krax, finally crashed through the gates of the capital city. Although the citizens of Citadel shuttered their windows and hid, the Fleshstompers had a specific goal to stop the Insatiable Court from fleeing the city with supplies and valuable information and artifacts. They move to block many of the King Gaius’s Court, but several key figures managed to escape the city.In the Jadenvyne Jungle, the 7th Legion of Stormcast, cutting through to reinforce a village on the other side, encountered a portion of Neferata’s skeleton legion. Although the Black Knights seemed to ride into the battle, wave upon wave without end, the Stormcast managed to hold their ground against the massed ranks of undead. After their earlier defeat in the Lowenthrall Forest, Lord Venwyrd appealed to the reticent Aelves of Dawnland and secured some resources, if not Aelven units, to counterattack the Chaos invasion of the forest. But this second attack in the forest was not led by rampaging Orruks… this time an army of Nurgle smashed through the trees, supported by a massive horde of Skaven plaguemonks.By the end of the battle, Lord Venwyrd had been severely wounded and most of the forest was in ruins or corrupted by the vile essence of Nurgle. The Chaos invader fleet, after securing Blackshadow Bay, encounters a small but determined fleet of defenders on a mission to explore the Uncharted Floating Islands among the far northeastern region of the kingdom. We had a fantastic assortment of ships available for a variety of naval missions during our campaign, and during the afternoon planning session the Dawnland defenders decided to send the Spirit Krushas, a fearless warband of Ashen Orruks. During their journey sailing through the bay and toward the islands they were intercepted by another Orruk fleet, this one joining the Chaos invasion as an excuse to wreck destruction on everything in their path… including the fleet of ships crewed by the Spirit Krushas. The Spirit Krushas win the battle and capture the Chaos fleet, turning the tide against the invaders. The Chaos invaders have overrun the borders of Dawnland, burning villages, cutting down arcane trees in the Lowenthrall Forest to leave it a landscape of scorched stumps, and looting the mystical and ancient temples in the Jadenvyne Jungle. Citadel still stands under control of the Duardin as the Chaos invaders left the city alone, but most of the land has been soaked in the blood and sweat of the myriad defenders. Now, only a few days before the Great Eclipse, the Chaos invaders coordinate their attacks to seize and control at least two of the several Dawn Gates…if they can control the gates then they can determine where the Shadow Ziggurat will next appear, and if they can attack and control the Ziggurat before the Great Eclipse then they will remove the soul and stop the heart of all Dawnland. Friday night the Chaos invaders attempted to take and hold at least 2 of 3 Dawngate portals which would allow them to at least predict if not control the movement and appearance of the Shadow Ziggurat. If they could put one of their on at the top of the Ziggurat during the moment of the Great Eclipse then the conquest of Dawnland would be assured and the destruction of the realm would be easily accomplished. Neferata leads her army into the ruins of an ancient Dawnland city where a Dawn Gate stands guarded by the Insatiable Court. The skeletal legion pushes relentlessly into the elite Court, but they fail to budge the guard and wrest control of the Gate. In the Badlands, the 7th Legion stands tall against the chaotic charge of Goredrak’s cavalry. Stormcast stand strong once again protecting the second Dawn Gate. In the splintered remnants of the Lowenthrall Forest the Spirit Krushas countercharge the rampaging Nurgle force, and Rudneck ‘ead Smasha rode his Maw Krusha into the center of the Shaven battleline; the battle raged for ages but Goredrak finally fell from his mount. After King Gaius forced Neferata to retreat from the ancient ruins, he uses an arcane rod of teleportation to infuse the corpse of the Maw Krusha in the Lowenthrall Forest to stir back to life and resume the battle. In the city of Citadel, the Duardin miners rallied for a labor strike, siezing control of the city center with a list of demands. As the other Low Kings of Dawnland strived to keep the Chaos invaders from capturing more than one Dawn Gate, the Duardin tribes succumbed to civil war in thIn the city of Citadel, the Duardin miners rallied for a labor strike, siezing control of the city center with a list of demands. As the other Low Kings of Dawnland strived to keep the Chaos invaders from capturing more than one Dawn Gate, the Duardin tribes succumbed to civil war in the streets. The Fyreslayers stand their position in the city square, prepared for anything. The city guard take positions, armed with the best ranged weapons from the arsenal, and the captain of the guard makes a final demand that the rebellious Duardin return to their work in peace. While the Duardin tribes resort to fighting among each other in the streets of Citadel, and the Chaos invading armies struggle to secure at least two Dawn Gates so the location of the Shadow Ziggurat can be determined, the remnants of the barbarian fleet sailing to regroup happens to spots the Ziggurat on the shore. Changing course, the fleet sails for shore as the daylight begins to fade, because after sunset the Ziggurat will vanish into the shadows, teleporting to another location in Dawnland. These Bloodbound must secure the Ziggurat before it relocates. Two separate armies of Bloodbound, 3K points equivalent according to the General’s Handbook, start the approach to the shore. They must push through the Sylvaneth defenders and have at least one model reach the base of the Ziggurat by turn 6. The ships land on turn 3. Chaos forces disembark and pour across the shore, smashing into the Sylvaneth defenders. Just as the last rays of sunlight vanish, a demon prince with only, wounded and bleeding, manages to climb onto the lowest level of the Ziggurat before it teleports. As the sun dawns on the foretold day of the high eclipse, the greatest champions of the most powerful and prestigious of the Low Kings gather on the Shadow Plain as the Ziggurat appears and the gauntlet is to be run. The champion which can race to the top and remain standing against all other contenders when the eclipse is resolved will be the representative of the High Shadow King of Dawnland for the next Seven Years. The dozens of champions sent by the most powerful and prestigious of the Low Kings of Dawnland gathered in a field on the Plain of Shadows during the morning of the high eclipse, the place where the priests had foretold the appearance of the Shadow Ziggurat. And the Ziggurat appeared, as expected, but the presence of Chaos agents was not expected. The champions battled each other and the agents of Chaos to position their houses for the final race to the throne at the final moment of the eclipse. All of the champions slaughtered, save for three–two of which are agents of the Chaos invaders–the final eclipse begins and the race for the throne begins. Neferata’s agent, bounding up the levels of the Ziggurat ahead of the others, reaches the throne and reveals her true self. But then the agent of Nurgle reaches the top, knocks Neferata’s agent down with the swing of his staff, and is–in turn–knocked down by the champion of King Gaius. After Neferata’s agent snapped up the barbed daggers of the fallen king’s champion, she kills the Nurgle agent and claims the High Throne for Neferata. In a final twist of devotion, she declares herself High King of Dawnland and victory for the Chaos invaders, but secretely hopes to turn the conquest of the kingdom over to Nagash and the Grand Alliance of Death. After the tournament event during Saturday, some of our Warlord players had exhausted their leadership abilities and retired to their tents. But our Overlord players, after the afternoon games on the Shadow Ziggurat, and a few Warlords, were still ready for more mayhem. Neferata, on her way to the crowning ceremony in Citadel, stumbled into a Chaos ambush. Once partners in the invasion, now the Fleshstompers of Fine Bloodwine were determined to exact their revenge against the betrayal of Neferata. Fortunately Neferata’s lieutenants knew the ground of the Jadenvyne Jungle after fighting and surviving several battles in the wilderness, and they managed to deliver their Queen through the peril. As Queen Neferata travels to Citadel for her coronation ceremony as the High Queen of Shadows, the Low King Gaius returns to the city with the remnants of the royal fleet in an attempt to stir the city to resist the new Queen. Ships clash in Blackshadow Bay with the remnants of the Chaos fleets, and the waters are choked with burning wrecks and broken vessels. But King Gaius is victorious, and just as he prepares to disembark and step onto the docks of the city, his remaining forces are best on all sides–from one shore charge an army of beastmen, and from the other side the dreaded army of Nurgle. After the epic sea battle, the survivors climb aboard the remaining ships or crawl up from the holds below decks. Beastmen charge from the northern docks, and Nurgle forces from the southern. Gravely outnumbered, King Gaius prepares his defence, but overconfidently splits his forces to counterattack both armies simultaneously. A Great Unclean One steps across a gangplank and boards the listing Duardin ironclad, taking the fight to the guard of King Gaius. Gaius begins to realize his cause to gather the denizens of Citadel to resist the false Queen of Dawnland may never be realized. Sunday afternoon found the narrative in a new and interesting place. Stability had returned to Dawnland with a new ruling High King, the capital city intact and government functioning, and the Shadow Ziggurat secured by an invader. 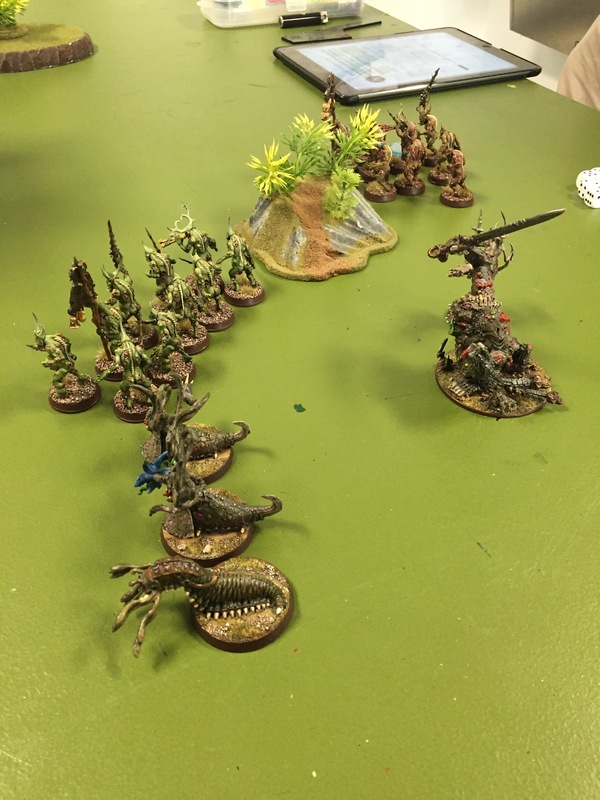 Victorious armies of Bloodbound and Nurgle turn on each other in the Jadenvyne Jungle, rushing to secure artifacts and finish the corruption of the verdant landscape. Lord Invictus, his Stormcast capturing King Gaius, has the captive removed to a Dawn Gate where his high priest begins a ritual to restore order to King Gaius and send his soul to Azyr. But the Insatiable Court will not stand by idly and watch their King turned, and they rush through the gates of the ruined city to liberate their King. The fight is fierce, but at the final moment before the ritual can be complete, King Gaius is removed from the gate and saved so he can rebuild his army and, perhaps one day, liberate Dawnland from the invaders and sit on the High Shadow Throne himself. 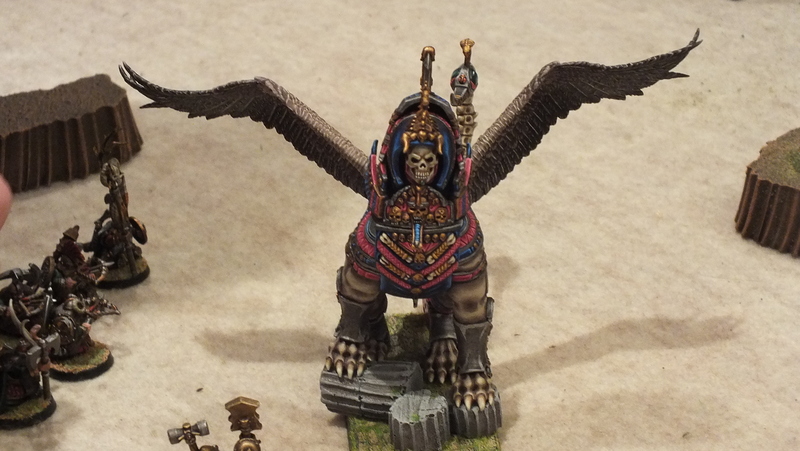 Meanwhile in the unexplored badlands, Neferata led her chosen guard to a forgotten Dawn Gate to attempt a ritual to contact Nagash and inform him of her power over Dawnland and offer the conquest to him. Of course, Sylvaneth powers, still loyal to Dawnland natives, rose up to stop her. Neferata’s household guard stood their ground, and in the fading moments of the day she managed to contact Nagash and inform him of her success. I’m looking forward to Camp Nerdly again, coming up the second weekend in May. And, for the fourth year in a row, I’m thinking about what I can do in the kitchen. Camp Nerdly is an annual gaming event in the Prince William Forest Park, where close to 100 gamers gather in the woods to play tabletop board & card games along with storytelling games. It has become my favorite “volunteer” effort each year (I say “volunteer” because I spend more time planning and working in the kitchen to provide 4 hot meals throughout the weekend than I spend actually playing games). Here’s a shot of my truck after I unloaded food into the walk-in cooler in the main dining hall back on Friday afternoon, before everyone else arrived, back in 2014. Every year I’ve had an assistant, along with a crew of volunteers to clean up after each meal. A tenet of the Camp Nerdly experience is every attendee signs up for a chore, so that registration costs can be kept to a minimum. And it is that extra help that has allowed me to enjoy some gaming during the weekend, at least. But this year, with 2 assistants willing to help, I think I can really power up the menu and possibly include a hot lunch on Saturday. If you’re interested in a fun gaming con located in Northern Virginia in a relatively rustic setting which is also family friendy (there are still hot showers along with hot food, so it’s not exactly primitive camping), then I suggest you consider attending this year. Check out their website. Autumn is a great time to visit battlefields in Virginia–not too hot, but clear and mild weather with all the variety of hardwood trees changing colors which sets a pleasing frame to the carefully mowed fields and lonely field artillery. And since it’s not summer, there are no crowds, especially during the week days. I spent a few days this past week in October to visit several battlefields around Richmond, Virginia, and after walking along miles of paths and reading scores of historic markers and plaques, by Friday I was tired and ready to stay within the city limits. 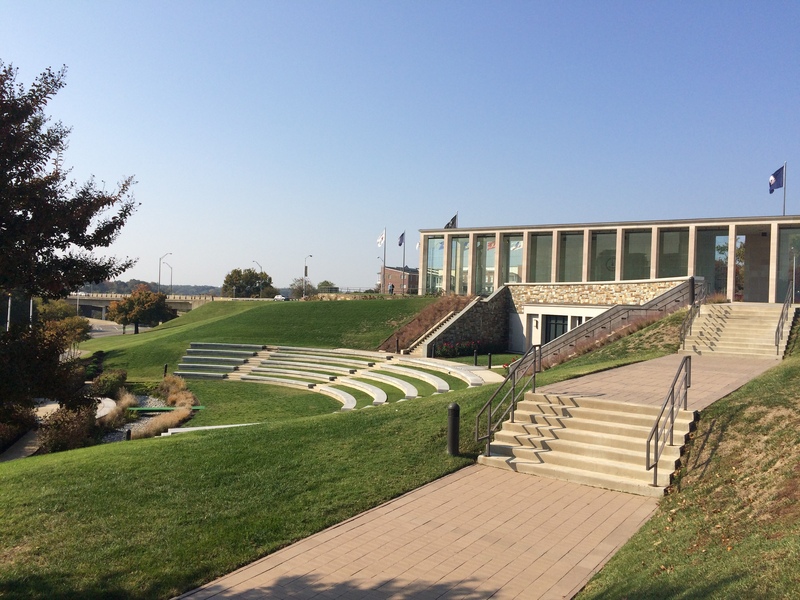 After breakfast with my wife at the hotel, we parted ways, and I drove down to the Virginia War Memorial. 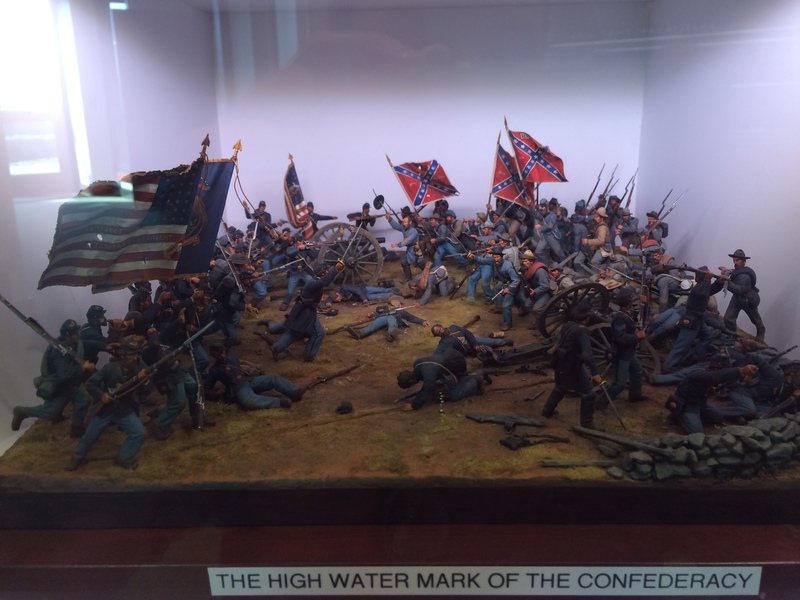 The memorial was built in 1956, but more recently a visitor’s center was added, and in the basement I marveled at an extensive collection of tiny painted soldiers, some of which were set up in dynamic dioramas. These are just a portion of the 7,000 figure collection, all painted and donated by a single hobbyist. 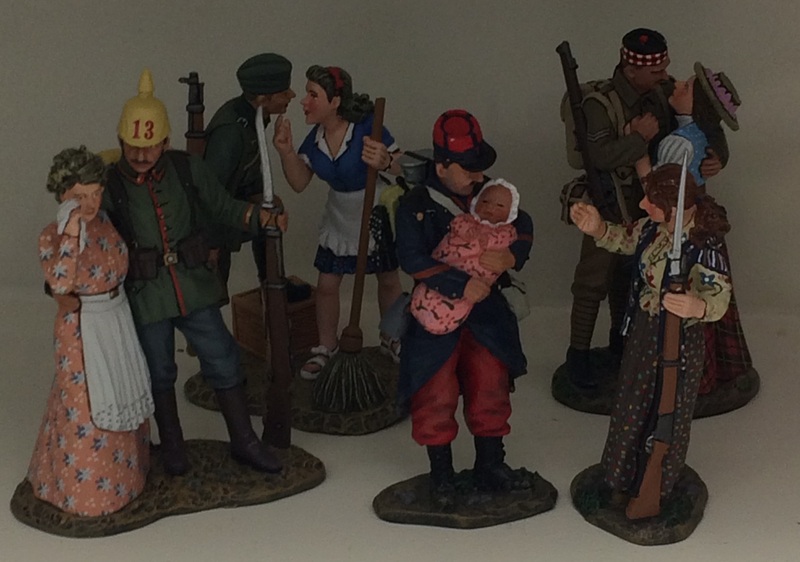 These figures are larger than the 32mm figures I usually paint, standing around 54mm high. Some were even larger. 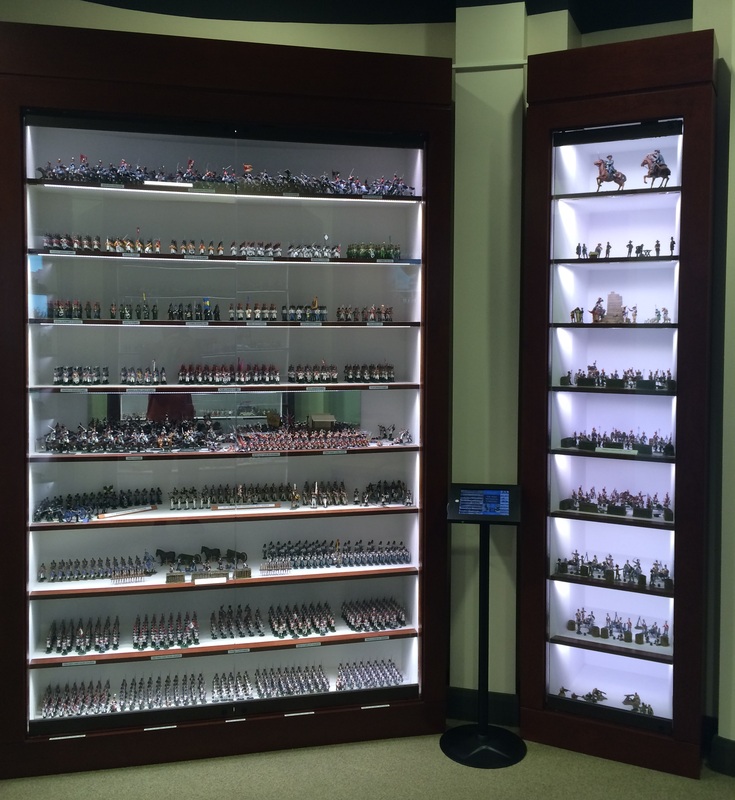 These display cases are only half of what’s in the visitor’s center. The detail on many of these figures are quite incredible. The patterns on the dresses of the figures below, for example, must have been painted by hand. And on figures smaller than your thumb! I later spent the afternoon walking along the canal and riverbank of the James. It was a beautiful afternoon, and I enjoyed coming across a very vocal songbird before doubling back to check out the old Tredagar Iron Works. A new game & hobby store opened in town this past weekend, and I realized I’m still feeling strange about the old one that closed a year ago. There are several reasons why the old Friendly Local Gaming Store closing without notice was, for me, something like going through a bad breakup with an ex-girlfriend; chief among those reasons was how much energy I had devoted to helping out with online promotion. In fact, I’m still technically an administrator for the FB page which is still up, and I feel a small ache of disappointment each time I receive a notice that someone new has “liked” the store’s page so many months after the sudden closure…. But the old FLGS closed almost a full year ago, and, although I occasionally dream that it reopens and I walk in to see some old friends and play games and organize events, I know it’s going to stay closed forever. So, it’s time to move on. And after checking out the new place in town, now open for business, I’m pleasantly surprised. 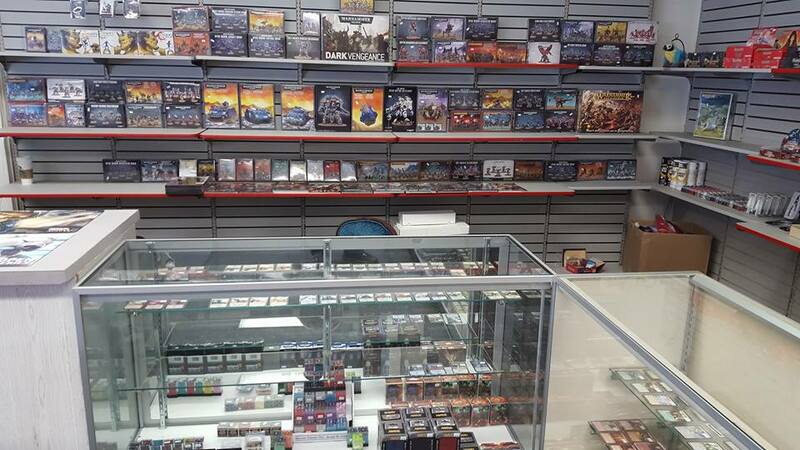 Before I visited inside, I had doubts they would even stock the sort of games I prefer to play, and I considered not even bothering to check out the place because there was no way it could fill the gap as a FLGS for me here in my little town. But curiosity overcame skepticism, and the store is a gaming and hobby space I have only dreamed about–it’s clean, in a good location, stocks a variety of awesome products, features plenty of gaming tables (especially a couple of tables for miniature gaming), and the proprietor is a friendly guy with all the right attitude about community and customer service. I’m reluctant to stretch the analogy between a favorite FLGS and a romantic relationship, but I find the best way to get over the hurt and disappointment of a favorite game & hobby store closing down is finding a new one open which is more appealing in every way than the ex. For the third and final round, the TO set up the realmgates I had put together with some help from a couple of the local players in my group, with one prominently at the center of each table with a special scenario to score victory points by holding or even controlling the 10″ diameter space around the center of the gate. The scores up to this round were close, although Norbert had claim to a significant lead with his Tomb Kings. But despite Tim’s Brettonian knights charging in and wrecking skeletons across the field, the Green Knight was busy elsewhere and the Lady remained with the artillery in the safety of the rear, and the Tomb Kings once more swept the field and won the final objective. 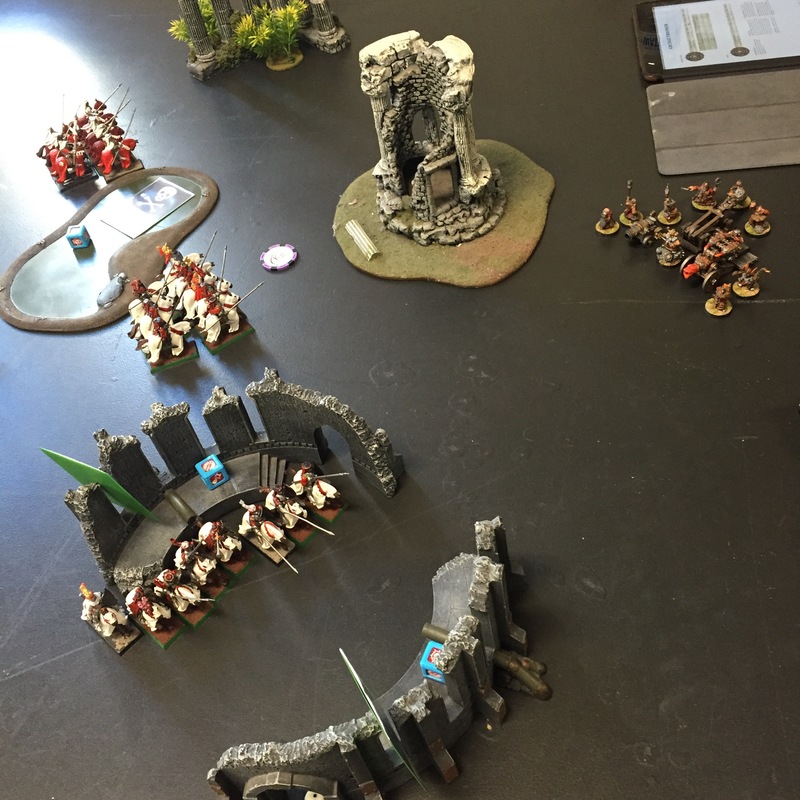 All together, everyone seemed to enjoy the casual nature of the event–Age of Sigmar is still new to all of us, and everyone was still learning new aspects of the rules along with the house rules we had put together for the event. I certainly had a great time helping out with NOVA this year, and with helping to organize and run the Age of Sigmar event in particular. I’m already planning terrain pieces and a narrative event for next year! Norbert won the overall painting & battle points prize, Richard won best battle points with his Skaven army, and Eric won best painter. 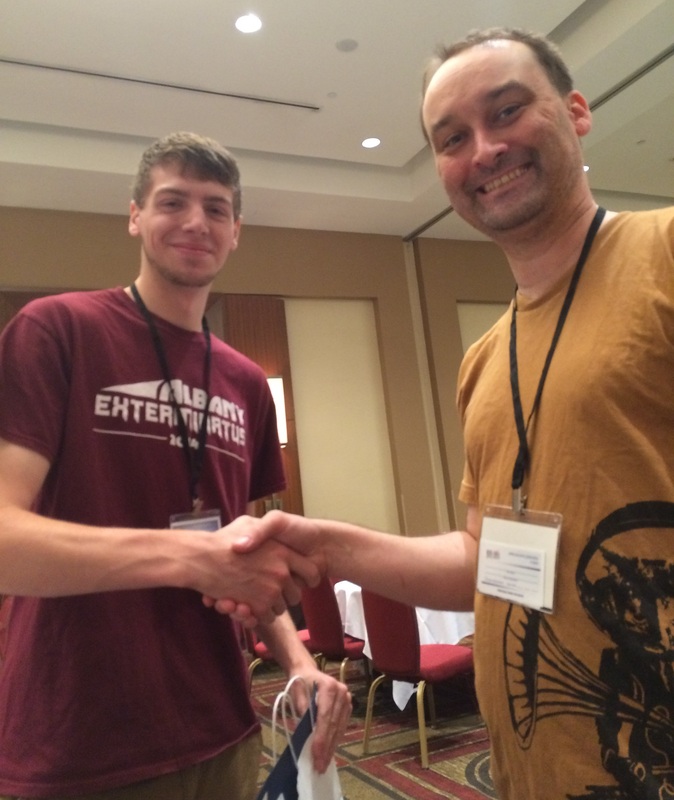 Finally, on Sunday, we awarded the campaign prize to Sean for playing additional games and making the longest trip down from New York to attend. 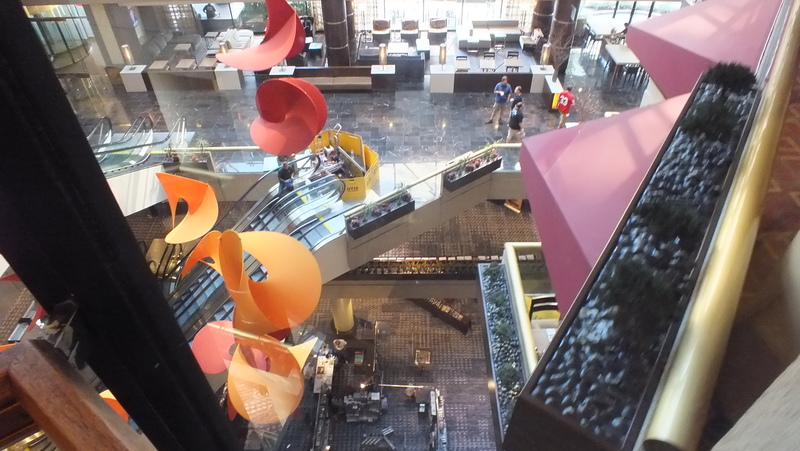 First, I can’t say enough about how awesome NOVA Open is as a gaming convention. Walking around, there was so much to see, from the huge Imperial Star Destroyer scaled to the X-Wing game, complete with lights, to the vendor hall with mini medic tables for quick repairs, the lemonade raffle with prizes for players losing games, and the demo tables for Wrath of Kings and HALO Fleet Battles. Saturday morning started with everyone on time and ready to play. We had a great group of players, everyone already acquainted from the games played the night before, and we were ready to roll. The first round was randomly matched. We had two players with Duardin, one with Wood Elves, another with Skaven, Tomb Kings, and, of course, Tim with his Bretonnian Knights which looked as awesome on the table as they did on their display board. 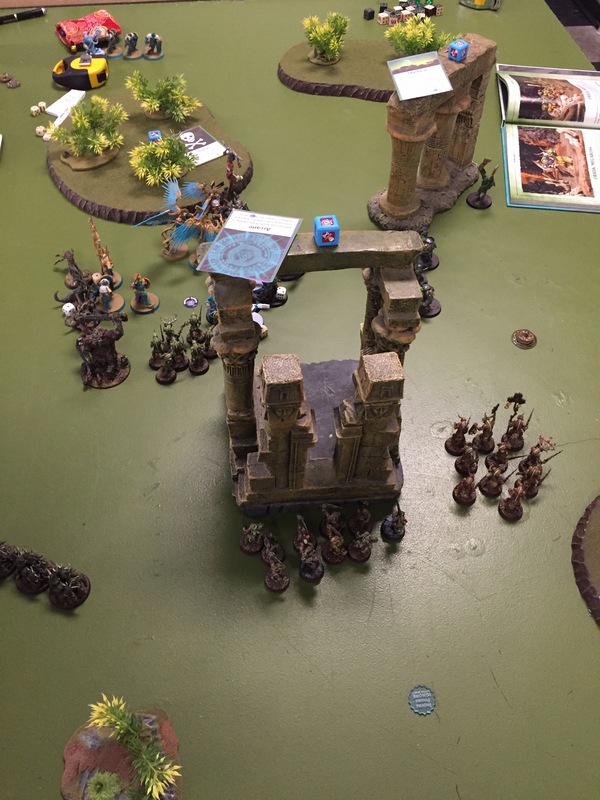 The Duardin seemed to be no match for the Tomb Kings and their summoning, but this was largely an experiment with competitive play in the relatively new Age of Sigmar game system. 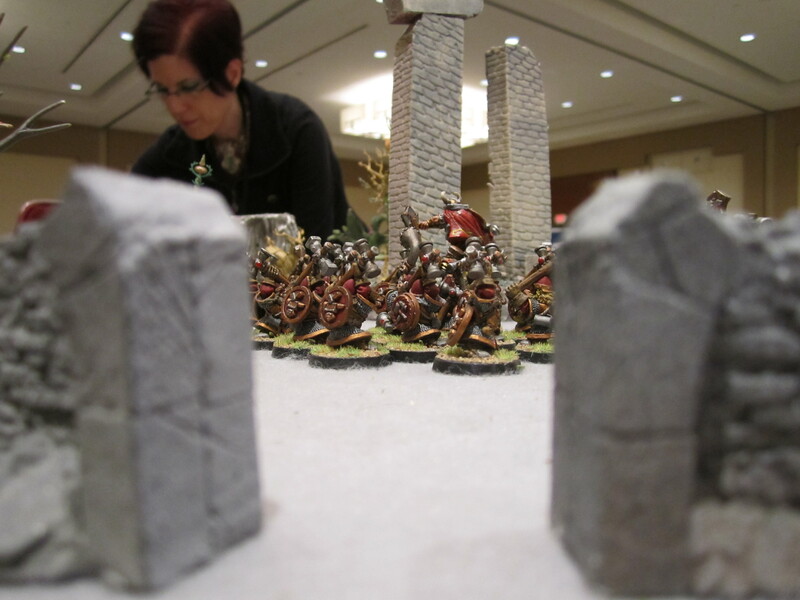 Everyone was proud of their painted figures, and the atmosphere was fun and adventurous, and the players were gracious in giving us credit for trying to organize an Age of Sigmar event merely two months after the release. I have never before had the privilege of managing such a fine group of players–there were some questions about the rules, and again of the special restrictions in place for this particular event, but otherwise the players managed themselves. After lunch, we were off with the second round, and the Skaven were on the battlefield in force. But those Bretonnian Knights came on fast, and the Green Knight could not be killed. At the end of the day, however, the Skaven hordes put up a good fight, and they managed to hold critical ground which was key to victory. 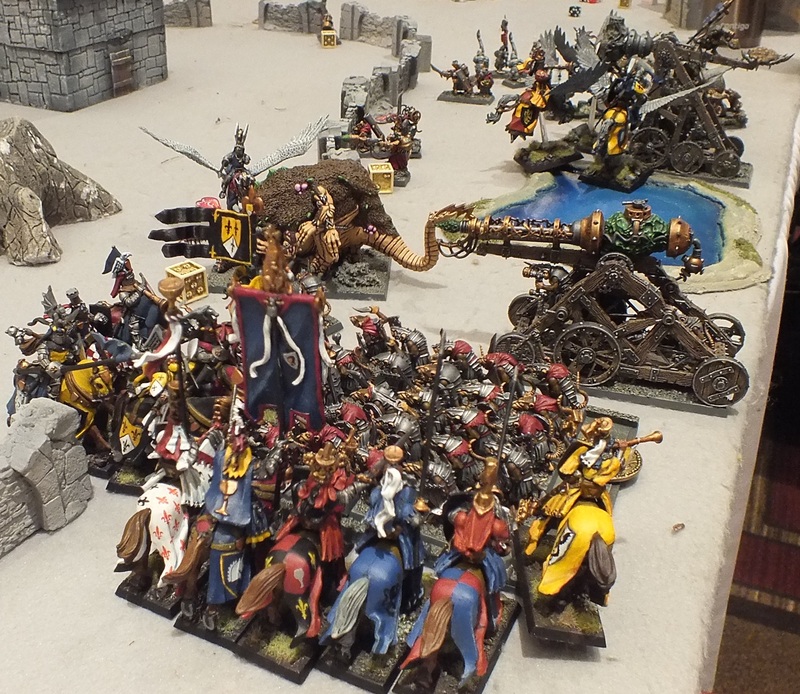 The Tomb Kings, however, continued to roll over their opponents, and another Duardin army was destroyed. The end of round two left everyone ready for more. Even Laini was ready for the final round, even though she had challenging fights in the first two and was convinced she would end up placing last in the ranking at the end of the day. Again, this was the most incredible group I’ve ever had the privelege to manage–I joked with my co-lead and the TO for this particular event that the players didn’t even need us. 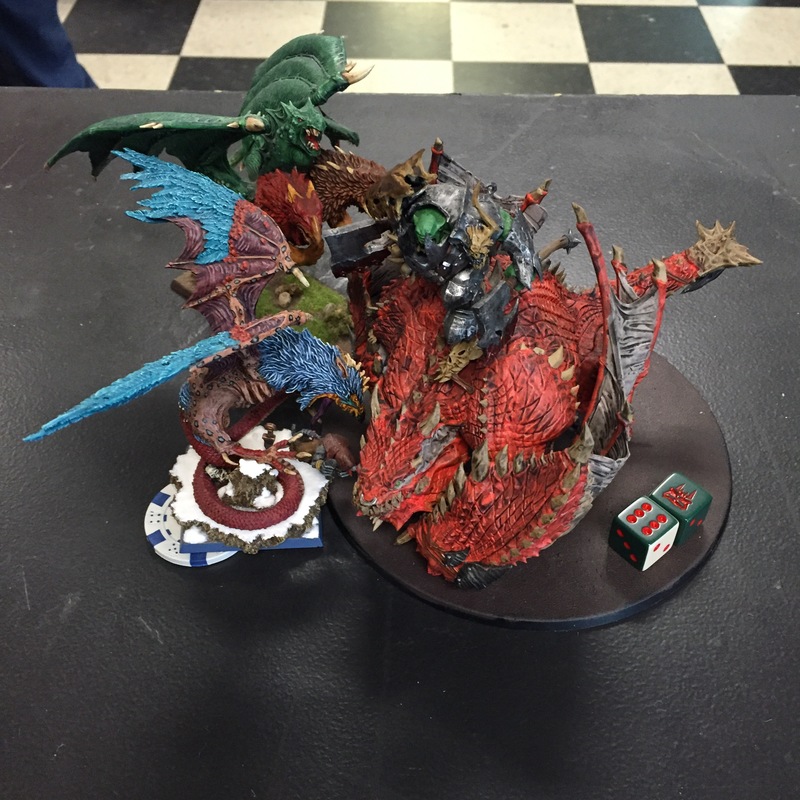 I’ll save the final round and results of the first Age of Sigmar event at NOVA Open for the third and final installment of this blog series. It is finished! And I had no reason to worry. 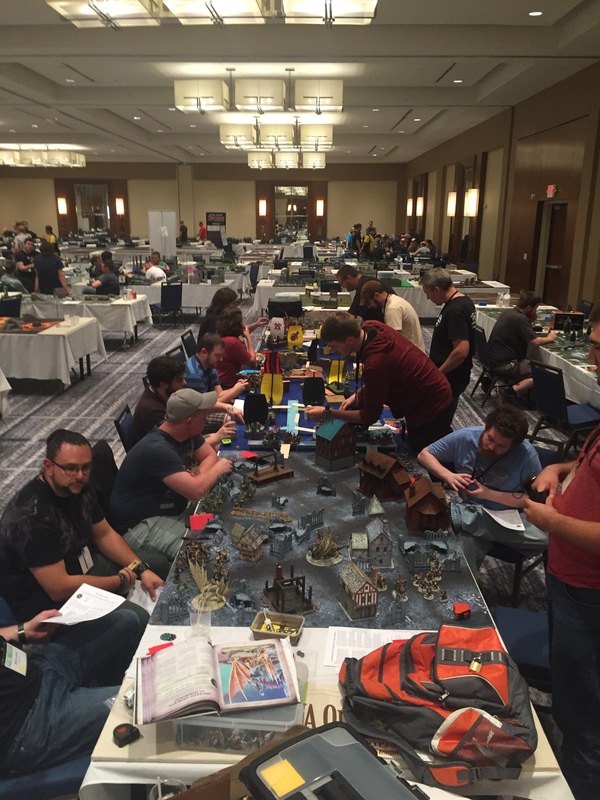 We didn’t have much time to plan, but everyone at the NOVA Open was helpful and supportive–and, most importantly, a small but enthusiastic group of players showed up to play games and have fun! Things got off to a great start when I picked up the guidebook containing the schedule and event guidelines–it was only about two weeks ago that we submitted the material (after the deadline), but here it was with graphics and in print! 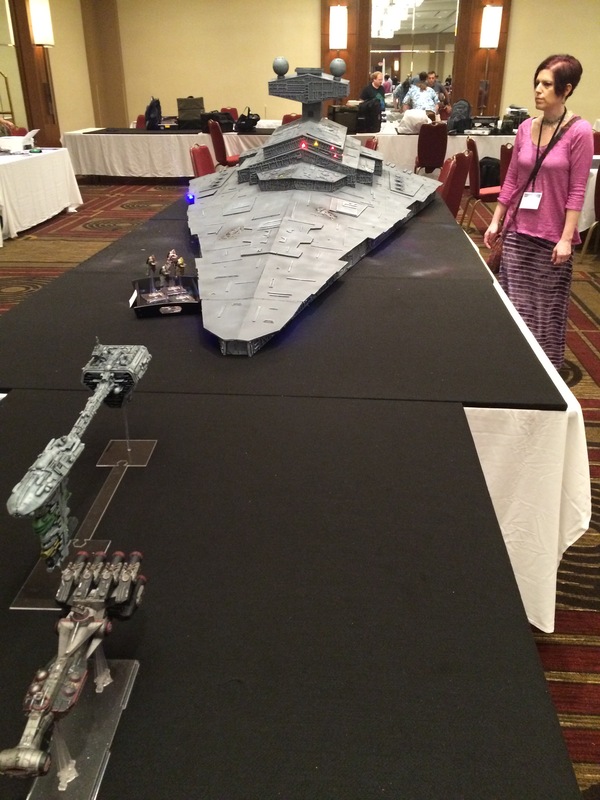 Then I descended to the ballrooms on the lower level to meet my co-lead; he had already set up terrain on our designated tables, and this was the moment when I was most excited and nervous. Sure, players had registered for the event, but would they show up and have a good time? 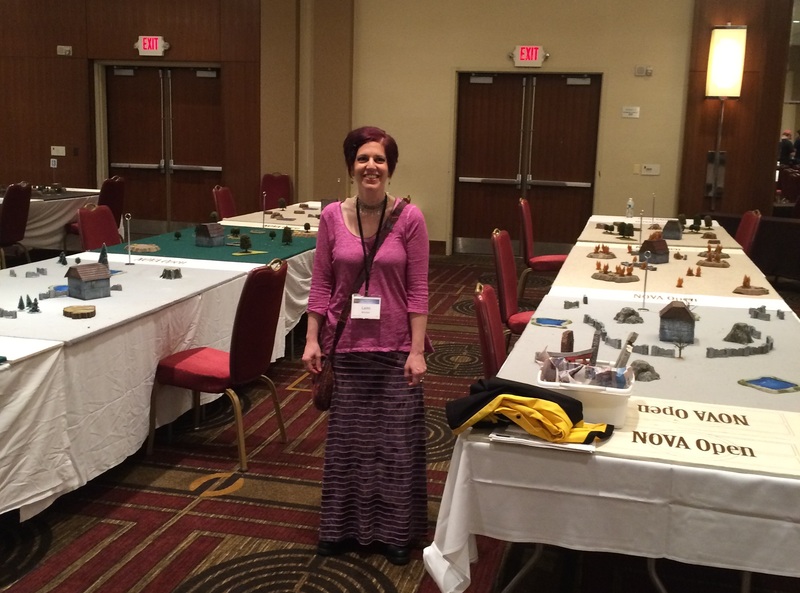 One of my prime motivations to get involved with planning all this was my wife–she surprised both of us last month by trying and enjoying the game herself, and she was excited to participate and share the experience of the NOVA Open with me. We had a great location in the big hall behind the Hobbit event which featured some fantastic terrain, and next year I aim to emulate the energy and leadership of the lead for the LotR events. It was humbling to watch him in action with his larger group of players. Overall, we had a decent showing for GW fantasy games even without 8th edition Warhammer Fantasy. Friday night we met in the foundation lounge where a big suite had been converted to a bar and hangout space and all the proceeds for the drinks went to charity. Everyone met and talked about Age of Sigmar for an hour, keeping attitudes positive, and then we went downstairs to play some games. I wanted a relatively casual evening of gaming without many composition rules or restrictions, so we played for achievements–most of which did not just reward removing models from the table. 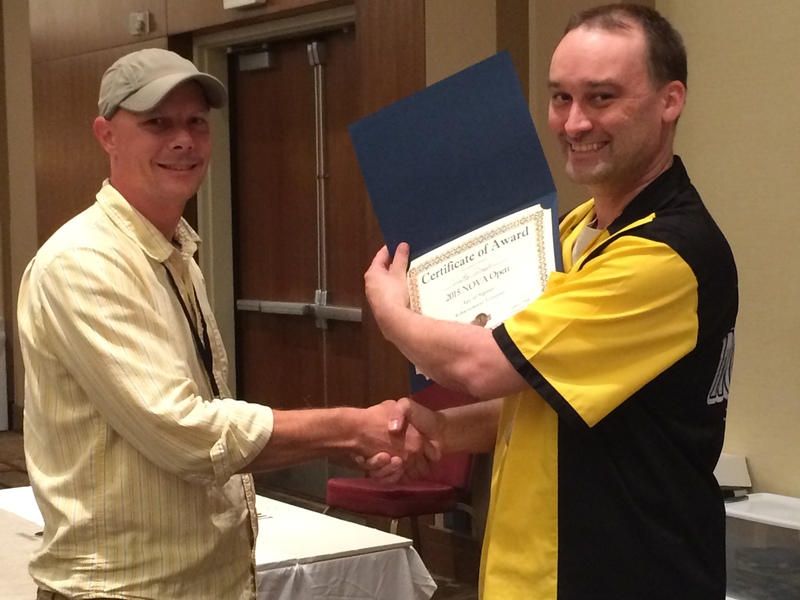 After 2 rounds, Tim with his Brets was awarded the first certificate for our AoS events of the weekend. Unfortunately, I don’t know how to hold an award and shake the winner’s hand while posing for a camera at the same time! But Friday night was a relief–I did not need to worry about hecklers or unhappy players, and even though my wife lost her first game she wasn’t discouraged and remarked about how fair everyone seemed to play. 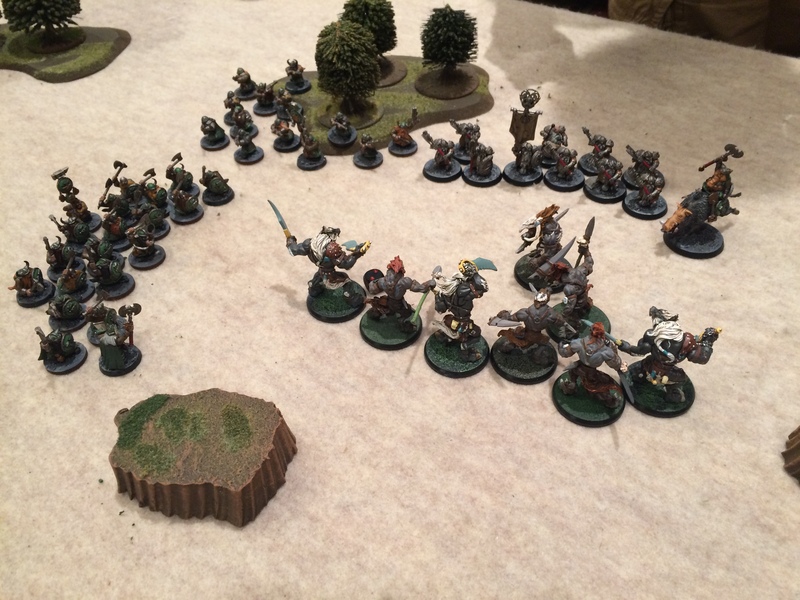 I managed to get in a practice game with an opponent as well–I didn’t have my Stormcast Eternals finished, and my wife had borrowed most of my painted Wood Elves, so I set up a force of old Wolfen Confrontation models as proxies for Ogres. One unit in particular chewed through several small units of plump Duardin. 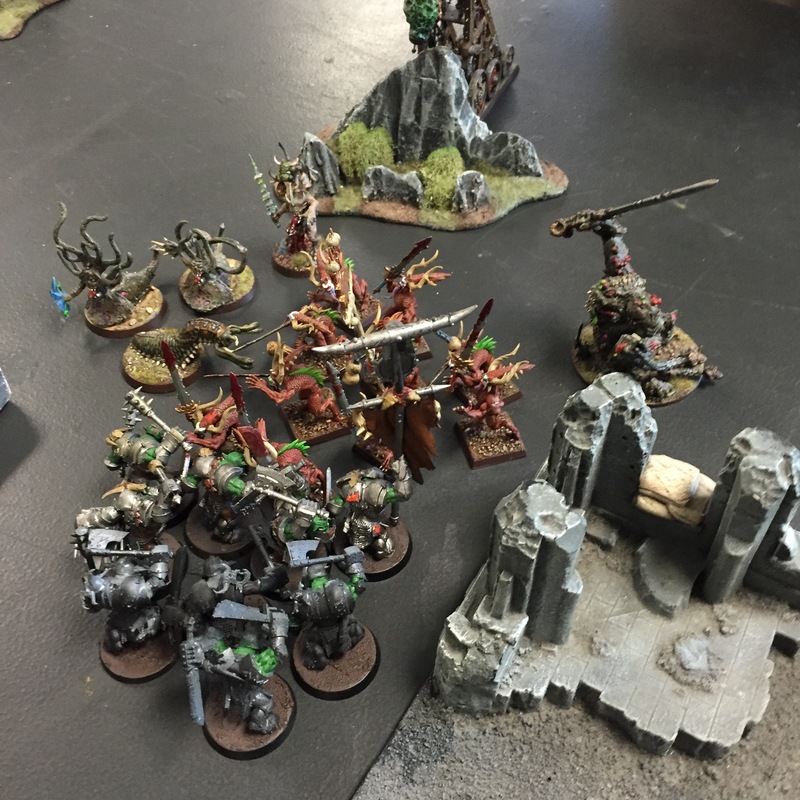 Even though the Duardin force outnumbered my “Ogres” by more than 200%, we didn’t need to use the Sudden Death victory conditions, and our collective experience over the course of the weekend reinforced everyone’s suspicion of using that new rule in games featuring classic Warhammer factions. I have plenty more pictures of Saturday, but I’m going to save those for a second post.